For your safety, wearing a ski helmet is highly recommended. 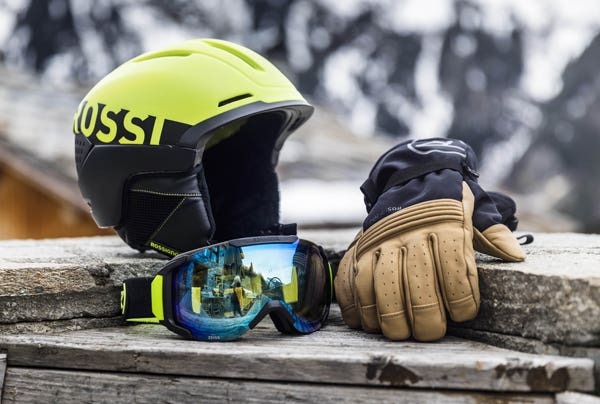 Rossignol therefore offers a complete range of helmets, meeting the EN 1077 European standard for optimal protection. Here are a few steps to choosing the right helmet that will fit you. To ski safely, it is essential to choose the right size. Our ski helmets sizes can be expressed in two ways, either in centimetres or with the S, L, M, XL. Here a few steps to finding your size: Take a tape measure. Place the meter above your ears and eyebrows. You should find a size between 52 and 62, corresponding to the size of your head. With this size you will then be able to choose your helmet. Make sure that when you shake your head, the helmet does not move back and forth! And also that the headset leaves enough room to slide your glasses or ski mask ... but not too much! For an even better fit, choose a helmet with a size adjustment system or a BOA system. The quality of the liner is a key element for your comfort. Prefer nice foam that adapts to the shape of your head. Some foams are removable, ideal for washing. Prefer models that come with removable ear pads for better hearing, and providing better comfort. This will also allow you to still use the helmet when the temperature increases. Choose a helmet light enough not to be disabled in your movements. Rossignol offers helmets that weigh around 450 g, which represents no discomfort for their users. For a lighter helmet, choose an In-mould construction helmet, which will be lighter, while ensuring full protection. A helmet will keep your head warm, so you need to choose a well-ventilated helmet to evacuate sweat successfully. 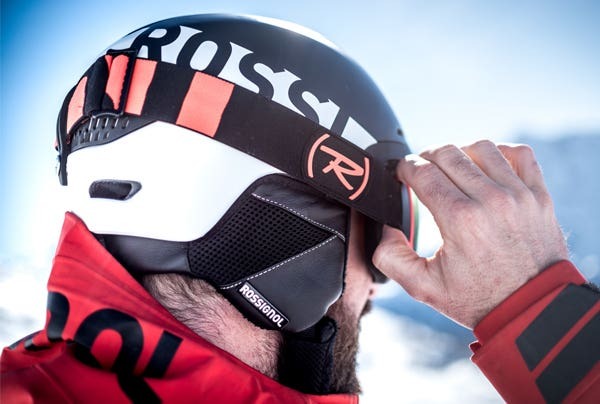 Rossignol helmets are equipped with either the Natural Ventilation technology to evacuate hot air or moisture, or with the Active Ventilation technology to manually regulate the ventilation to ensure comfort whatever the conditions. Some helmets use an EPP foam rather than EPS for stronger protection. The new Rossignol helmet SPARK uses EPP expanded polypropylene foam, which provides a greater degree of flexibility to a shock. For music lovers, Rossignol offers ski helmets with audio from the Audio Inside technology. The idea is simple: the headphones are integrated within the ear pads. Other helmets offer the possibility to directly connect your own headphones. CAUTION! Using an Audio Kit when practicing winter sports can prevent the user to perceive correctly the sound environment and thus cause collisions with other users. ABS: Outside shell of the helmet made out of plastic (polycarbonate) moulded as light as possible, but with good shock absorption. These helmets offer more durability against everyday falls, while providing a good impact protection. In Mould helmets are made by attaching the shell and shock-absorbing foam in a single moulding process. They bring more lightness and comfort ventilation to the helmet. EPP: Expanded Polypropylene is a multi-impact foam, recovering its shape and most of its impact protection slowly after a crash. It basically keeps its shock absorption proprieties through many impacts. EPS: polystyrene foam provides excellent protection against impact while being incredibly lightweight. Expanded Polystyrene is one of the most widespread foams used. Goggle holder: It secures the elastic band holding the goggles of the user and avoids losing it. Roll neck: The neck guard is available on some of our helmets. This element of comfort fills the space between the neck and helmet to improve thermal comfort. On some helmets, it incorporates the fit system. Size Adjustment system: an adjustment system using a dial to change the size for more comfort fit. Boa is the world's premiere closure system. The dial, lace, and guides that comprise the system work together to deliver more effective, even closure and adjustment than traditional closure systems. Active ventilation: you can control the air flow through a closing and opening system. Adjustable vents enable airflow to be increased or decreased for more control over heat escape and temperature. WHEN SHOULD YOU CHANGE YOUR HELMET? In any event, if the helmet has suffered one or more shocks, it is recommended to replace it because it could be damaged, often not visible, which can reduce its effectiveness. The life of a helmet is directly related to how you use it, so it’s more or less it’s exposure to weathering, moisture and UV rays. Thus, we recommend never using a helmet beyond five years after the date of manufacture (date indicated on the label Month / Year of manufacture inside the helmet according to CE EN1077 standard). HOW TO TAKE CARE OF YOUR HELMET? To ensure maximum and sustainable protection from your helmet, it is preferable to handle it carefully and carry it in a fabric cover. It should be stored away from heat or sunlight. The materials of the helmet can be altered by contact with oil, cleaning fluids, paints, decals, or other foreign material. Use only water and mild soap for cleaning. The conditions of use and storage of the helmet have a direct and important impact on its performance. It is therefore essential to regularly check its integrity and its components, the absence of deformation and / or cracking of the inner shell, the system efficiency retention and quality of the seams ... For even more personalized advice, do not hesitate to turn to one of our shops.